Around 1992, I received a personal call from Museum curator Richard Oman. As a quilt lover himself, both artistic and historic, he was aware of my growing prominence in the Salt Lake City and LDS community quilting world. He told me about the upcoming 3rd International Art Competition sponsored by the LDS Museum of Church History & Art. He wondered if I had ever considered preparing a quilt art entry. 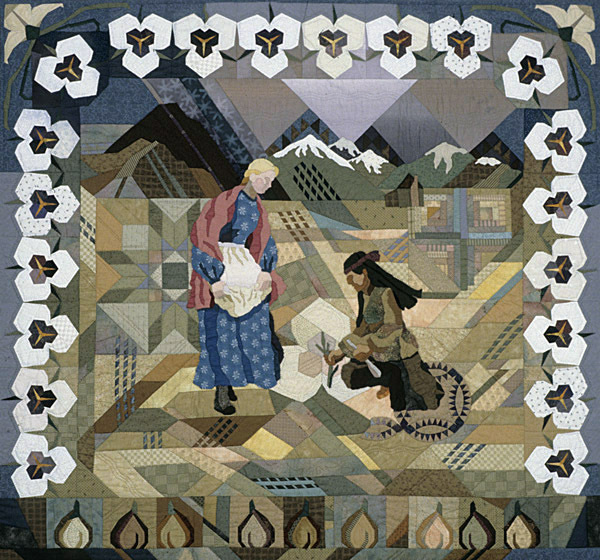 At that time, I was mothering very young children, was attempting to grow my quilting pattern business, was serving in a significant calling in my LDS ward, etc. I told him that I was interested, but in order to be able to give it sufficient attention and creative energy, it would probably be a while before I could prepare and submit an entry. I let him know that I had a ready-made original quilt that might fit the theme, and inquired about entering "On Zion's Mount" (which later became a pattern in my Hearthsewn line). That quilt was submitted, accepted through first round jurying, and ended up as part of the show. So began my cherished experiences with that tri-ennial event. I began receiving the advanced notification of the entry dates and themes, and within a year or two I started formulating an idea for my first entry. As background to the show, I will quote from one of the program brochures. 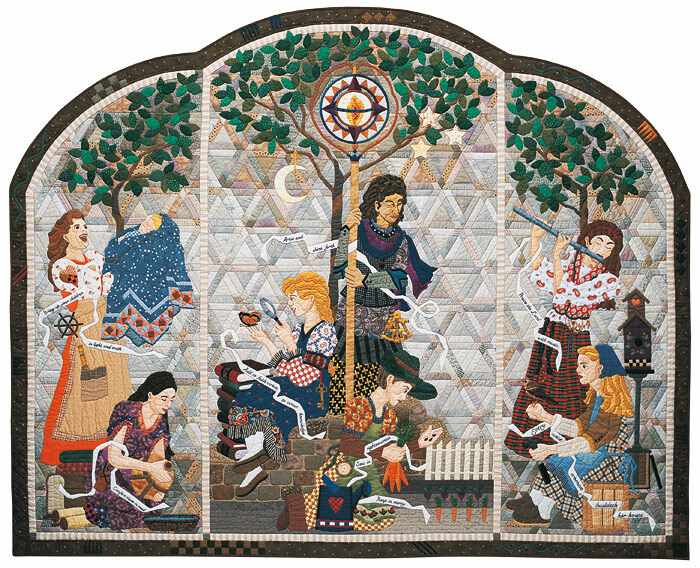 "The Museum of Church History and Art sponsors an international art competition for Latter-day Saint artists every three years. Each exhibition centers around a specific theme." By inviting LDS artists from around the world to prepare and submit artwork of varied styles, using different media (from oil and water color paintings, cast and stone sculptures, textile, photographic and mixed), and from a broad range of cultural perspectives, the Museum becomes more aware of the world-wide expressions of faith, and opens a pathway to procuring a significant collection of these works to be part of the permanent collection of the Museum. Toward this end, the Museum confers Purchase Awards to outstanding artistic creations which become property of the Museum and the Church. The first show I officially followed the entry procedure for was the Fourth International Art Competition, set to run during the 1997 Sesquecentennial Celebration of the arrival of the Mormon pioneers to the Salt Lake valley in 1847. The theme therefore was appropriately 150 years of Pioneering. As I cast around for an idea, I was inspired by the story of the sego lily. Within the first year of the pioneers' arrival, the settlers were suffering from the late planting and the lack of a full harvest. As winter waned, food supplied depleted. The long and current resident Paiute women (and men, probably) stepped in to share their knowledge of local food supplies, including the humble sego roots. These small white bulbs could, in a desperate situation, be pulled up, peeled, boiled, mashed, seasoned (if available) and eaten warm. Leftovers could be eaten the next morning for breakfast, but journal reports indicate this was even more ghastly than the original meal sounds. This small offering, growing wild, contributed to the survival of the residents through until they could plant and begin harvesting better things. It was a generous outreach by the Native Americans. Within a couple of years, the favor was returned, when the Paiute people suffered similar deprivations, and the Pioneer women were able to step in with food, clothing, quilts, etc. 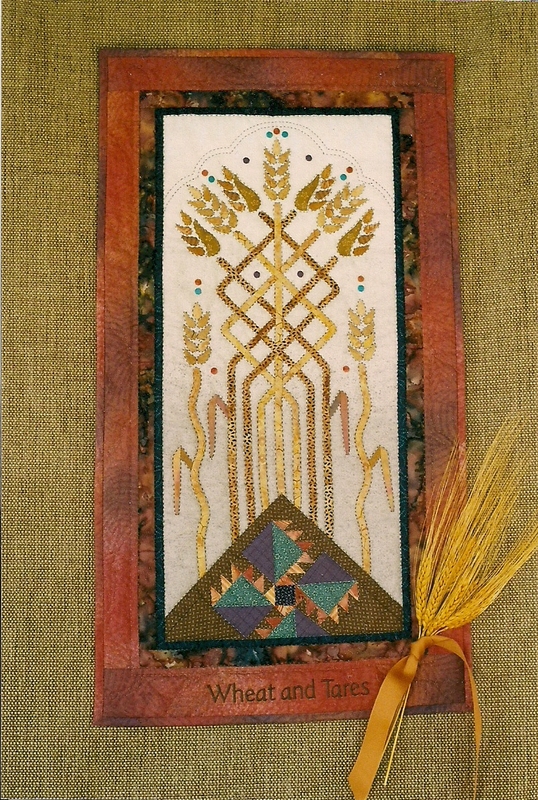 Here is my entry, "Sego Harvest: Roots of Intercultural Cooperation". 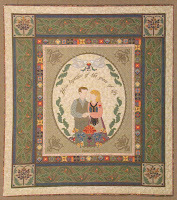 My art quilt was created using unique template piecing, pictorial (figures) applique, traditional quilt blocks embedded in the background, surface painting, and machine paper foundation pieced border blocks. It was awarded a purchase award and became part of the Museum's textile collection. The Fifth Competition theme centered on the Book of Mormon. Here was a chance to put into fabric an idea I had been pursuing to do an ABC quilt on stories and topics from our favorite scriptures. I took 10 months to design and complete, and in the end, XYZ were combined into a single block. The center panel is a representation of the Tree of Life, with the Iron Rod surrounding it.Theme words of Atonement, Brotherhood, Conversion, etc., were appliqued above each miniature pictorial block, with silk screen printed verses illustrating the idea beneath. I most often get comments on the pieced background, done in the "watercolor" patchwork style that results in a blending of colors and values within. The figure of Christ presented the biggest challenge: how to represent in fabric with my skills something so profound and sacred. I had a wonderfully spiritual experience during that process that remains the most remarkable part of this project. This quilt will prove to be the work of my life, and when accepted to the show, turned out to be a size issue for the Museum as well. A wall extension was added to the display structure to allow for the 14 foot length of the quilt. After this exhibit, the contest rules would include a size restriction. The Museum had learned their lesson, and decided to avoid similar situations in the future! 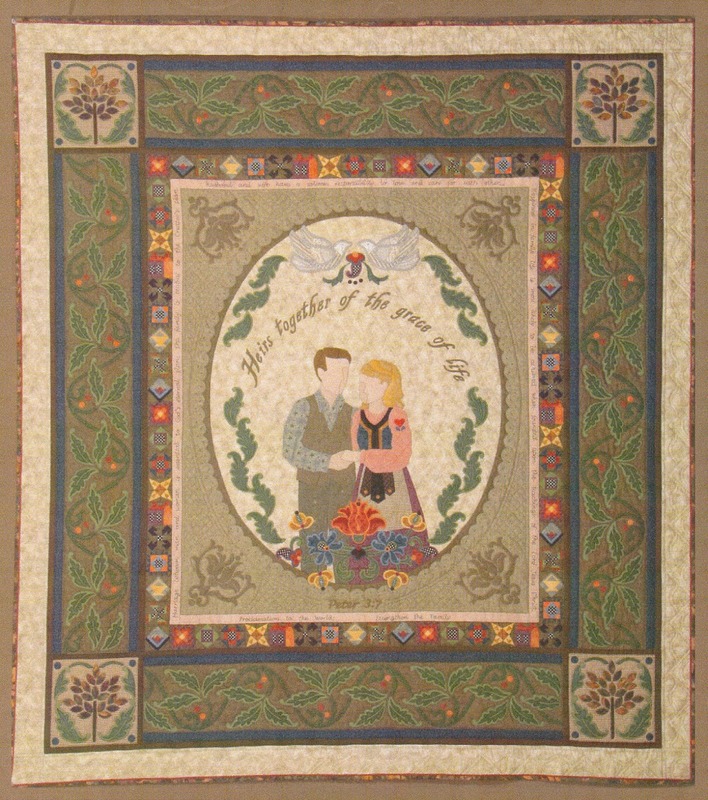 The quilt received a Purchase Award, and after the exhibit was nearly over, received a viewer-voted award of popularity. 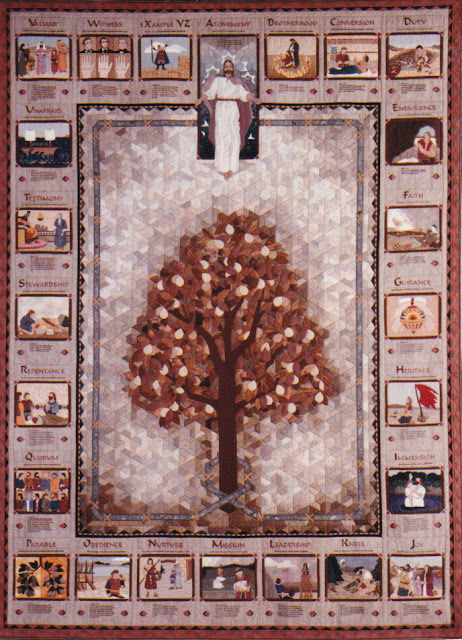 The next art quilt I envisioned and designed was a rather enigmatic presentation of several of the Parables of Christ. 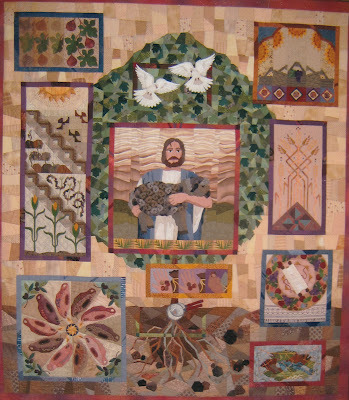 The quilt is titled "Veiled & Revealed: Parables of Christ." There are many individual, random sized blocks which each attempt to explain some aspect of a parable. In the center is the Good Shepherd, which is a Christ-like figure carrying a black sheep. Above that figure are a pair of white doves, and below is the anachronistic magnifying glass which shows the tiny mustard seed of the parable of the same name. Other parables include: Wise and Foolish Virgins, Seeds Sown, Talents, Laborers in the Vineyard, Marriage Feast, Cast Net, etc. The most recent art quilt entry of mine is "Facing Outward, Reflecting Inward: Temple Walls Teach". It is a row quilt that includes building elements of many temples that express symbolism of the concepts and teachings imparted by temple worship. Many of these lessons we can glimpse at from the grounds of the temples. The next competition will be held in 2015 with a theme, "Tell Me the Stories of Jesus". Ideas are already percolating. Thanks for viewing my quilts.